Inflammation is the cause of many common disorders like arthritis, ulcerative colitis and cancer. Conventionally, Non-steroidal anti-inflammatory drugs (NSAIDs) are used to treat inflammation and pain. However, turmeric and its active ingredient curcumin are natural and very useful anti-inflammatory and analgesic agents. Turmeric and NSAIDs have a similar working mechanism. Turmeric can also alleviate the side effects of these medicines. Dietary intake of turmeric is safe if you are taking NSAIDs. However, some studies report a possible interaction between turmeric and NSAIDs. Thus, when taking turmeric or curcumin supplements together with NSAIDs, it is recommended to maintain a gap of 3-4 hours. Is it safe to take Turmeric with NSAIDs? Let us have a scientific outlook on these facts. Numerous publications have reported turmeric and curcumin as potent inhibitors of inflammation, which has proved its potential to be utilized in treating several anti-inflammatory disorders. Turmeric’s inhibition of the cyclooxygenase enzymes is similar to the primary working mechanism of most NSAIDs. Some studies have also shown turmeric to be as effective as commonly used NSAIDs in reducing inflammation and pain. Thus, it can be said that turmeric can be used as a supplement or adjuvant in treating inflammation together with NSAIDs. In some cases, turmeric may prove to be much more efficient than some commonly used NSAIDs. As compared to one such drug, indomethacin, which is used to treat arthritis, turmeric was found to be more productive in reducing inflammation, pain and other symptoms and complications associated with arthritis. Also, in case of inflammation in Alzheimer’s disease, NSAIDs can reduce inflammation, but do not slow the progression of the disease. On the contrary, turmeric and curcumin, in addition to treating inflammation, can improve cognition and show neuroprotective aspects, which can slow down disease progression. Thus, they can be more beneficial than NSAIDs. 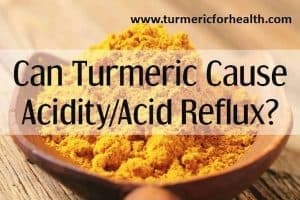 While the use of NSAIDs is linked to the occurrence of several adverse effects on health, turmeric is safe and does not pose the risk of severe side effects. It is considered safe even in high doses of about 8g per day. Several studies have stated the safety of turmeric over the use of NSAIDs. Turmeric has been identified as a natural, herbal and potent anti-inflammatory and analgesic agent and an effective alternative to NSAIDs for treating several inflammation-related disorders. This makes turmeric, a better candidate than NSAIDs for treating inflammation and pain. NSAIDs pose the risk of side effects including toxicity, gastrointestinal, liver and kidney problems. Turmeric is known to have gastroprotective effects. Due to its anti-inflammatory and anti-oxidant effects, it can prevent and treat gastric ulcers and cancer that might occur as a result of long-term or overuse of anti-inflammatory medications. Studies have hinted at the fact that pretreatment with curcumin can prevent the toxicity, oxidative stress and damage to the intestines caused by the drug indomethacin. Thus, use of turmeric along with NSAIDs may result in reduced side effects. As per other research, turmeric use with certain NSAIDs may result in synergistic effects and an increased therapeutic action. 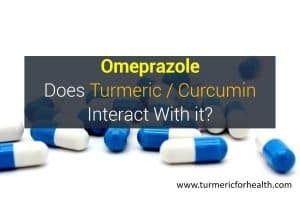 Turmeric or curcumin may also not interfere with the pharmacokinetics of the drugs. In one clinical trial conducted on 44 osteoarthritis patients, turmeric, when taken with diclofenac, resulted in better pain management and improved quality of life as compared to treatment with diclofenac alone. Also, no adverse effects were reported when the two were given together to the patients. Turmeric was seen as a potential adjuvant to diclofenac treatment in osteoarthritis. Some studies have also reported a possible interaction between turmeric and NSAIDs. NSAIDs, when taken with herbs having anti-platelet activity, may enhance the risk of bleeding. 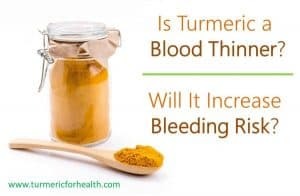 As the use of NSAIDs itself poses a risk of intestinal bleeding as a side effect, concomitant use with turmeric may elevate this adverse effect (no human study proves this though). Also, turmeric can influence drug metabolism in the body. It is known to inhibit enzymes and proteins responsible for metabolising various drugs. Thus, if one is taking turmeric or curcumin supplements with NSAIDs, it is better to keep a gap of 3-4 hours between their intakes to avoid unwanted interactions. However, if taking turmeric in diet, this amount is unlikely to have any significant effects. Also, it is advised to consult a medical professional before including any herbal supplement in diet, especially if on medications and determine the appropriate dosage. Raw Turmeric – One of the best ways to get benefits of this miracle herb. Just include into the diet in anyways you like! 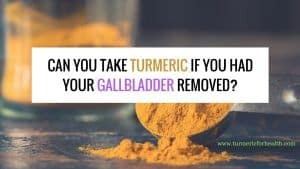 Do you take turmeric for pain and inflammation? Share your feedback on the use of turmeric! I have chronic inguinal pain since mid-summer due to post surgical pain (one year since 2nd operation in left inguinal). Seeing a surgeon and anesthesiologist. Tried nerve shot. Only lasted 24hrs. Would like to think that taking turmeric would help with inflammation of nerves and surrounding tissues. Hi. You could consider taking turmeric supplements since turmeric/curcumin is a natural analgesic and anti-inflammatory agent. Opt for standardized extracts. Avoid taking turmeric supplements on an empty stomach and close to the time of taking medicines. Maintain a 3-4 hour gap. I was taking diclofenac sodium to relieve the gout pain on my left knee joint. Then we read about tumeric as another possible pain reliever, which I then took in a cup of warm water. Clearly, the effect seemed much better compared to the former which I started taking a few days earlier. I take 500 mg. capsules for scoliosis and stenosis in my back. However, I have slowed down (was taking 1000 mg peer day) as it gave me gastro problems.